With its rubberised black finish and matching remote, the TF5010PVR looks the business for sure. It's not a bad performer either. It doesn't offer the multi-channel recording/watching of many other PVRs, but the TF5010PVR will record two channels while you watch a third live (if the third is on the same transponder as one of the others) and it will allow two channels to be watched at once with PIP. When you select a channel from the onscreen list those that are not available are 'greyed out'. The tuners are each set up independently (an identical channel list can be copied across) and can handle a DiSEqC 1.2 or USALS motor and a DiSEqC 1.1 switched system with up to 16 LNBs. The TF5010PVR is extremely fast at scanning satellites, taking 2.5 minutes to find the active channels on Astra. Programmes can be set to record from the EPG, and the TF5010PVR can start to play back a recording before it ends. It will also convert a paused live broadcast into a permanent recording. The HDD is a good size at 250GB (a version with 160GB costs £30 less) and pay-TV channels can be decrypted on recording or playback - useful with clashing programmes but only one CAM plugged into the CI slots. But the range of playback speeds is poor - only 6x forwards and a slow 3x backwards - although you can drag a pointer on the progress bar to go directly to a point in the recording. Usefully, a section of a recording can be marked and then deleted or saved independently. 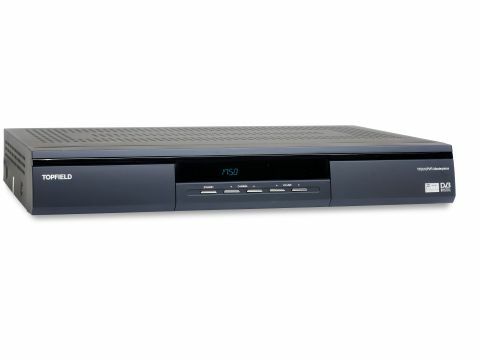 The TF5010PVR can also play back MP3 music files, downloaded from a PC via a USB connector, and it produces excellent sound from these and from recorded and live broadcast audio. The picture quality is superb, but the tuners don't always make the most of weaker signals.